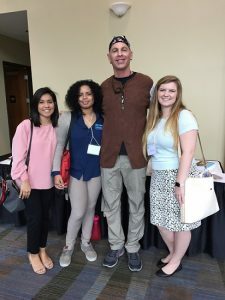 Victoria Ramirez, Tiana Gordon, keynote speaker Dave Burgess, and Jillian Arnold. Pictured (l-r) are middle grades majors Jillian Arnold, Rachel Allen, Tiana Gordon and Amanda Ellis. 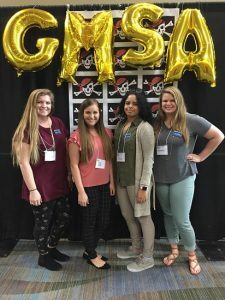 In February, five middle grades teacher candidates from Georgia Southern University attended the Georgia Middle School Association (GMSA) Annual Conference held in Valdosta. Georgia. Rachel Allen, Jillian Arnold, Amanda Ellis, Tiana Gordon and Victoria Ramirez learned strategies, methods, applications and other ideas from educators from across Georgia. Students also heard from keynote speaker Dave Burgess, author of Teach Like a Pirate, a inspirational book that offers practical and innovative ideas to increase student engagement, boost creativity and transform educators. Burgess encouraged attendees to strive to create “LCLs,” or life-changing lessons, for their students. “Dave Burgess really opened my mind to endless opportunities for the classroom,” said Gordon, a junior middle grades major. The GMSA is a leader for continuous improvement in the education of middle grades students. Assistant Professor of Middle Grades Education Amanda Wall, Ph.D., serves as the faculty mentor for Georgia Southern’s Collegiate Middle Level Association (CMLA) and is the Professors of Middle Level Education representative to the GMSA Board.